This accredited study programme (66 ECTS) of EU International Relations and Diplomacy Studies provides expertise in all aspects of the EU's external relations (foreign and security policy, trade, development, international financial relations, immigration, asylum, etc. ), the EU's external representation and relations with major countries and regions in the world as well as certain professional skills such as political risk analysis, Public Relations, impact assessment or project management. Students thus learn to understand the multifaceted international role of the EU in connection with the functioning of the complex EU system, and they acquire the sound theoretical and practical knowledge needed to succeed in a variety of careers in national, European and international affairs. In the first semester, starting in mid-September, students follow several compulsory courses. They ensure the necessary background with regard to the political, legal and economic aspects of the EU’s external relations and the practice of modern diplomacy. In addition, an introductory course is offered on EU institutions and decision-making. Language courses form an integral part of the EU International Relations and Diplomacy Studies programme throughout the academic year. In the second semester, starting in January, students choose among a range of optional courses. They explore in depth selected topics that were broadly introduced to them during the compulsory courses, thus giving them the opportunity to study specific areas of interest more closely and interactively.The selected courses cover at least three of the folllowing thematic clusters: "security, justice and values ", "foreign economic relations and sustainable development ", "bi- and multilateral diplomacy" and "professional skills". In addition, students follow two more compulsory courses which focus more closely on the Union's neighbourhood: a simulation exercise in the field of EU crisis management and a course on the European Neighbourhood Policy. Each student writes a Master's Thesis, generally in the framework of an optional or compulsory course. Abstracts of the best Master’s theses each year are published on the website of the College of Europe. 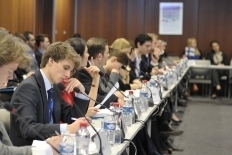 The study programme includes a study trip to Geneva, the European centre for multilateral diplomacy, in early spring. This trip is an integral part of the academic programme and the tuition fee. 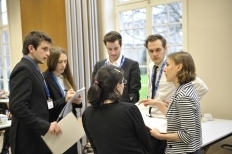 Beyond the regular courses, the Department offers many voluntary extra-curricular activities such as guest lectures and conferences as well as compact seminars on a broad range of topical issues relevant to the study of the EU's external relations. The Department also conducts its own research activities.